Subscribe to our YouTube channel to get how-to videos and other helpful information regarding lawn sprinkler system maintenance and repair. Hi! My name is Sean Mullarky with TriState Water Works: your prompt and professional lawn sprinkler service company. Today I’d like to talk to you about Backflow Preventers. They are the beginning of your lawn sprinkler system. It’s the first place the water travels through as it heads out to your lawn. Backflow Preventers are essential in protecting the drinking water. Their main is to limit water traveling from your lawn sprinklers back into the palatable water or your drinking water within your house. 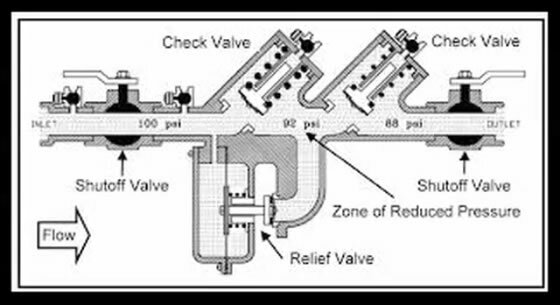 It does that by two check valves that stop the water from moving in a reverse direction and also a relief valve at the bottom. Now there are many different types of backflows that are used on lawn sprinklers. Typically, this reduced pressure backflow is what you will find on most homes. Sometimes there are other devices. The important thing is you should make sure that your lawn sprinkler system has a Backflow Preventer on it. This is a typical type of backflow you will find on your home for your lawn sprinklers. It’s called a Reduced Pressure Assembly. How it prevents water from coming back into the house is two check valves and also a relief valve that will dump water out of the bottom of it if there’s a backflow situation. Now the important thing is to make sure that these things are working properly. One way to do that is to give it a visual inspection. What you want to look for is a leaking water from any place on the backflow. If it’s leaking water out of the bottom of it, typically that can be easily repaired by cleaning it or putting in a rebuild kit on the inside. If it’s leaking from a crack or a busted part of the brass, then it probably means that your backflow is frozen and is going to need to be replaced. Backflows are very sensitive to freezing weather. If it drops down to twenty-four or twenty-six degrees, you need to protect your backflow. It’s best to have it taken off and brought in the house before we reach those temperatures. Some municipalities have you test these devices. So once a year they’ll send out a letter requiring you to have it tested. Let’s take look at how these devices are tested with equipment to make sure that you’re safe and working properly. When it comes time to have your Backflow Preventer tested, it’s important to use a certified Backflow Tester. TriState Water Works offers certified backflow testing. The reason why we test these devices is to make sure they’re working properly. Even though you may observe that the backflow is not leaking any water, you may not see any signs on the outside if there’s a problem. Internally, it may not be functioning properly. By performing the test with a calibrated tool like this, you can make sure the backflow is working to manufacturer’s specifications, ensuring you have safe, clean drinking water in your home. The Backflow Preventer is a very important part of your irrigation system. It provides clean, safe drinking water in your home. So if you have any issues with your backflow, please call TriState Water Works for prompt, professional service. Graduating from the Ohio state University in 1981 with a degree in Landscape Design and Construction Sean has worked in the green industry his entire adult life. Sean has been designing and installing efficient irrigation systems since the late 1980’s. Sean is certified with the Irrigation Association in the following areas: •	Certified Irrigation Designer •	Certified Irrigation Contractor •	Certified Landscape Irrigation Auditor •	Certified Golf Irrigation Auditor •	Certified RainXchange professional Sean is also registered with the EPA as a “Water Sense Partner” having demonstrated the ability to conserve water through proper design and management of irrigation systems. Sean is the owner of Applied Water Technologies an irrigation design and consulting firm and the operator of TriState Water Works the hassle free irrigation service provider Sean is also an Adjunct teacher at Cincinnati State Community College teaching the various irrigation classes and sustainable energy use in the landscape. Sean’s irrigation design work has encompassed Golf Course Irr., Sports Turf Irr. As in Baseball, Soccer, Football, Residential Irrigation., Light Commercial Irr., Large multi-family developments as in condominium complexes, apartment complexes, housing developments, agricultural irrigation as in field crops, pasture, vegetable farming, livestock operations, Irrigation for LID projects as in green roofs, bio-retention, natural area remediation, Industrial irrigation for temperature control, material cooling, and dust control, Nursery irrigation for both greenhouse crops, field crops and pot in pot operations, Waste water treatment for effluent dispersion, and odor control.